This home was built by the Reverend Noah Hammond around 1750. The home still stands on the West side of Mill Road. Noah Hammond was born at Newton Massachusetts on Feb. 14, 1717. He married first Anna Baker, 2nd Lucretia (Calkin) b. 1732, d. April 17, 1773. Elder Hammond preached at other places also, and was soon called to Long Island where he was invited to preach to the society founded at Coram in 1749. Here he built a church over which he presided until his death from smallpox. He traveled all over the southeastern portion of New York and Northern New Jersey preaching the Baptist doctrine and gathering church societies. 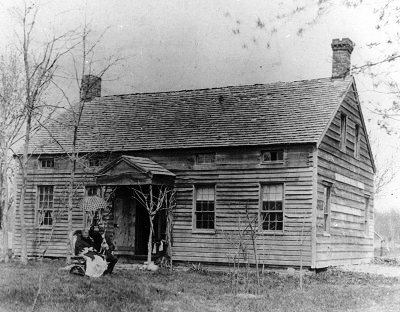 The building which he erected was used by the British as a stable during their occupation of Long Island, during which time the Hammond's and others were finding refuge in Connecticut. After the evacuation of the British, the sons of Rev. Noah Hammond returned to Coram and the building was used as a church again until 1847 when it was taken down and removed to Port Jefferson where it was converted into a dwelling house. It is said that the old floor showed the marks of the horse's hoofs until the building was removed. Son Daniel left the farm to his son Samuel, who then left the farm to his son Caleb. The 1858 Chace map and the 1873 Belcher Hyde map has the farm owned by Caleb Hammond. The 1900 census lists the occupants as Samuel Higbie age 60, and his wife Francis age 58. The 1909 and 1919 Hyde maps list the farm as being owned by Samuel Hibie. The current owners of the farm are the Manzoni's who had a dairy farm. Click here to read Elsie Manzoni's "Growing up in Coram"